Readers and critics alike raved over USA Today bestselling author Sally Thorne's smash hit debut, The Hating Game, which has sold in over 20 countries. Now she's back with an unforgettable romantic comedy about a woman who finally has a shot at her long time crush—if she dares. Darcy Barrett has undertaken a global survey of men. She's travelled the world, and can categorically say that no one measures up to Tom Valeska, whose only flaw is that Darcy's twin brother Jamie saw him first and claimed him forever as his best friend. 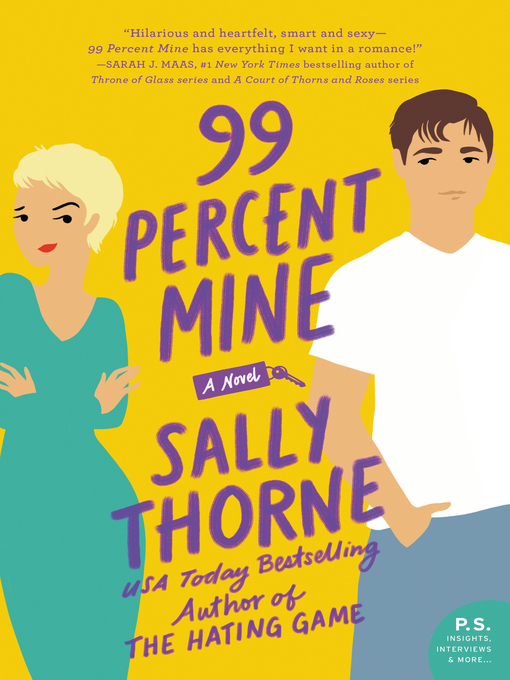 Despite Darcy's best efforts, Tom's off limits and loyal to her brother, 99%. That's the problem with finding her dream man at age eight and peaking in her photography career at age twenty—ever since, she's had to learn to settle for good enough. Suddenly Darcy's considering sticking around to make sure her twin doesn't ruin the cottage's inherent magic with his penchant for grey and chrome. She's definitely not staying because of her new business partner's tight t-shirts, or that perfect face that's inspiring her to pick up her camera again. Soon sparks are flying—and it's not the faulty wiring. It turns out one percent of Tom's heart might not be enough for Darcy anymore. This time around, she's switching things up. She's going to make Tom Valeska 99 percent hers.